WELCOME ...we hope You are in fine health and having a Successful day ! BUILD your foundation of knowledge, Develop your plan and take massive action towards your Dreams, Desires and Life Goals. A simple plan takes you from where you are to where You want to Be. Act on this plan DAILY ... and it will re-act on You. Part 6 is a summary of "The Divine Spirit Series" looking at many Ways to develop POSITIVE ENERGY and giving practical tips along the road to Mastery of Self. Filled with Simple, practical principles for Health & Vitality. A link to Back Issues is at the end of this Ezine. Stay Tuned for next month's NEW Series ... "The Natural Environment Series" - Spotlighting Practical, Universal Principles and tools for the protection of Human survival on our planet. 'harmony of mind/body/spirit' is a KEY to your SUCCESS. Ancient knowledge and 21st century master strategies to guide you to experience Incredible levels of Energy and Inner Peace. Learn how to tap into your INNER POWERS, balance your life energy and unlock your Full Potential. Knowledge is Power and we aim to give you the essentials for vibrant Energy and real Health ! A NEW series begins next month with added features, inspirational truths and an updated format for easier reading ... stay tuned ! "The Natural Environment Series" - the future of Humanity. In this series we will examine some of the problems facing Human Beings on the Planet Earth today. We will also look at possible solutions and HOW we can all play a part in the survival of our species. It is important to protect our families and future generations by respecting the environment. "The Secrets of Success Series" - abundant Health and Wealth. "The Health and Harmony Series" - tune in for Peace and Calm. The KEY to your life lies within YOU and unlocks the door to an Amazing Inner World. You can learn how to tune Your awareness to develop extra Energy and Vitality. "For extreme ilnessess extreme remedies are most fitting." "Thousands upon thousands of persons have studied disease. Almost no-one has studied health." "God is a circle whose centre is everywhere and whose circumference is nowhere." "In the final analysis, humanity has only two ways out - Either universal destruction or universal brotherhood." If Your mind is upset, the natural functions of your body also become disturbed. When the mind is Calm, the body is relaxed, spontaneous, free and easy. A PURE MIND controls the body and a Mastery of the body leads to a pure mind. World Religions, Spiritual Leaders, Spiritual Healing, The Easy Way, Universal Energy, Summary of Divine Spirit. We learnt that World Religions are formal teachings belonging to the growth of certain races during periods of human thought and evolution. Each religion served its purpose in its own day and time. But each must give way to something more complete as humanity advances. We saw that prophet's or Guru's are said to speak through Divine Inspiration and get messages from a higher place. They may be able to prophesy, see future events, heal, help and inspire people. Prophets usually have a great many followers and have gone on to found a religion or system of faith. Gurus offer spiritual guidance to a smaller number of disciples, and may not be linked to a particular religion. Hinduism, Buddhism, Christianity, Confucianism, Taoism, Islamism, Judaism, Zoroastrianism, Sikhism, Theosophy, Christian Science, Shintoism, Jainism, Spiritualism, Sufism, Native American beliefs, Shamanism, Theosophy, New Age, Mystery Cults, Scientology, Christian Science, Jehovah's Witnessess, Mormonism, Moonies, Hare Krishna, Rosicrucians, Bahai, existentialism etc. Leaders such as : Mohammed, Guru Nanak, Buddha, Jesus, Moses, Dalai Lama, Morihei Ueshiba, Mother Meera, Maharishi Yogi, Bhagwan Shree Rajneesh, Apollonius, Dionysius, Pythagorus, Socrates, Aristotle, Plato, Rama, Krishna, Hermes, Pythagorus, Confucius, Lao Tzu, Freud, Jung, Sartre, Gurdjieff, Meher Baba, Carlos Castaneda, Edgar Cayce, Sri Chimnoy, Erich Fromm, J. Krishnamurti, Elizabeth Kubler-Ross, Ram Dass, Wilhelm Reich, Yoga, etc. According to many of the Spiritual and Religious movements, there are five planes of existence in which we can experience our being. Within these are many sub-planes and other levels we can visit to gain valuable lessons in life. The five planes are : Physical, Astral, Causal, Mental, and Soul. The true saints of God were people who could rise up above the mind and its traps, doubts and fears. The BEST way to decide on your path is to ask Yourself " What am I drawn to"? There your answers will be found ! 1) Denial of Reality where we get absorbed and occupied with other things or we become ill.
2) Attempting to prove our behaviour is rational, worthy of self and social approval. 3) Placing blame for our difficulties onto others. 4) Repressing or preventing dangerous thoughts from entering the mind. 5) Regressing or retreating to earlier development levels that require less mature responses. 6) Feelings of worth by identifying ourselves with persons or institutions of high-standing. 7) Covering up weaknessess by emphasising desirable traits. 8) Releasing pent-up anger on something that is less dangerous than those who may fight back. 9) Reducing involvement and withdrawing into passivity to protect ourselves from emotional injury. 10 Bolstering our ego for self-worth despite failure, by seeking sympathy from others. One of the BEST methods to free us from these burdens is to re-balance our chakras and Boost our energy centres. This can be achieved through the practise of Yoga, an ancient, tried-and-tested method of complete training. We discovered that many people have decided to take responsibility for their own health and well-being using a positive mental attitude. A crisis is an opportunity in disguise and no matter what life throws at us there is a Way to roll with that energy. This means that illness and dis-ease are obstacles and stepping stones to healing and enlightenment. Spiritual healing involves an inner power which encourages the body to heal itself. Some healers are able to transfer excess energy to others. They treat the whole person, removing any blockages of energy and promoting a feeling of health and well-being. We must dedicate some time to DAILY spiritual exercises in order to build up spiritual stamina. Contemplation of the secret worlds of spirit is the answer and the search is within us. The spiritual life is an active life where we can become the knower by Doing and giving to life so that life may give back. Spirit shows up in goodness, fair play, a ready ear, tranquility and calm, and a growing love for All of life. A more detached inner life means that if our plans don't work out as we think they should, life won't crush us. We cannot hope to attain vibrant health without looking at the principles and laws of nature. There are many subtle forms of power and energy available to us almost anytime and anywhere. We sometimes forget that the most natural things in the World are powerful sources of energy. Air, Water, Nutrition, Exercise, Sleep and Relaxation, Mind Power. Are You searching for POWERFUL IDEAS that can Motivate You to change Your life for the better ? with over 2 million loyal customers." They currently publish and/or distribute more than 150 authors and over 1,400 titles in five key areas: Personal Development, Business Strategy, Sales and Marketing, Wealth Building, Mind, Body, Spirit. We found many changes taking place on the planet and more and more people are looking for answers to their questions. To approach and understand the DIVINE SPIRIT it is essential to keep our bodies healthy and free from tiredness, pain, ill-ness and dis-ease. Our minds should be calm and clear. Everything that happens to us is recorded and reflected by our bodies. For this reason we are effecting our health with our thoughts, emotions, mental attitudes and frame of mind. Every culture in the history of the world has acknowledged the existence of a powerful energy in the human body : Prana, Chi, Ki, Magnetism, vital life force etc. Mental states emit types of energy known as beta, alpha, theta and delta brain waves. Buddhist, Taoist and Tibetan monks have preserved many ancient Chi Kung/Qi Gong techniques, that they used for health and longevity. The elements of Heaven, Earth, Fire, Water and Air are the building blocks of our planet, we could not exist without them. WHAT can we personally DO to live a healthy, vibrant and happy life ? THE EASY WAY is to remove from our lives All negative energy and focus on filling our lives with POSITIVE Energy ! The following "Secrets", if applied DAILY, will help you to make Powerful, Lasting changes to Your health and well-being. 1) Go to your natural environment and BREATHE DEEPLY. 2) Drink plenty of PURE WATER. 3) Eat ORGANIC FOOD and Supplements. 4) Gently STRETCH for flexibilty. 5) Mentally and physically RELAX. 6) Focus on POSITIVE thoughts. 7) List your life GOALS. Make a plan, using willpower and discipline as tools in the early stages, and after a while, momentum will help to develop GOOD HABITS to become a more permanent part of your life. Once You have prepared your body and mind by purification, then You will have far more Success with your approach to the Divine Essence. If you are lacking in Energy and Vitality, you can Purify your Life by CHANGING your lifestyle. AIKIDO is a highly developed martial art and the way of harmony with universal energy. Founded by Master Morihei Ueshiba, who developed the ability to control many attackers at will. He was also regarded as the most spiritual person in Japan and spent much of his later years in study, prayer and contemplation. He was unique in his ability to express his understanding of universal principles of nature in practical demonstrations that defy normal definitions of reality. Many millions of practitioners around the world are experiencing the benefits of regular Aikido training. We put You in touch with people who are MASTERS at what they do. With their Excellent products, advice, motivation, strategies and techniques, you cannot fail to succeed. Fail to Prepare ... Prepare to Fail. Maybe one of the following Top-Notch Resources will be of benefit to you <> on Your individual path to Wisdom, Personal Power and Freedom ....... Enjoy ! Breathe Pure Air - Deeply ! Learn everything you need to know to focus like a laser beam and Burn through all obstacles between you and Your Goals. Take care of Your future... after all it IS in your hands - BUILD IT ! You can work at home, enjoy your work and develop a Great Income, using your hobbies and interests ...Reach for Your Goals ! Look out for the "The Natural Environment Series" which feature's methods and ideas that help to protect our fragile planet. Simple, practical, natural, universal principles. Filled with inspirational truths ... stay tuned ! Tony Wilden is an Aikido Instructor and qualified in several Healing Arts. He has a deep interest in spiritual matters, health and environmental issues, and the creation of harmony between people and nature. Tony is on a path to wisdom, freedom and power and shares his insights on ancient knowledge and 21st century master strategies. The information provided in Harmony of Mind/Body/Spirit is for educational purposes and not intended to diagnose, treat, cure or prevent any dis-ease. It should not replace the advice of your health advisor or GP. Remember, knowledge puts you in control of your life. Slow positive changes are best for maximum benefit to your health. Do you want cutting-edge tips on aikido, health, and well-being? 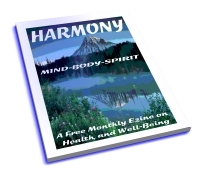 My free monthly Harmony ezine is a great resource. Sign up right now and grab your amazing gifts! I promise to use it only to send you Harmony of Mind-Body-Spirit.